Imagine for a second if your “something blue” was actually your wedding cake! That would be pretty incredible, especially if you chose something as stunning as this gorgeous blue and white cake. There's just something about blue wedding cakes that I find intriguing. Every bride should have something blue for good luck on her wedding day so why not make the cake blue? It's certainly not what people are expecting as a wedding cake color. 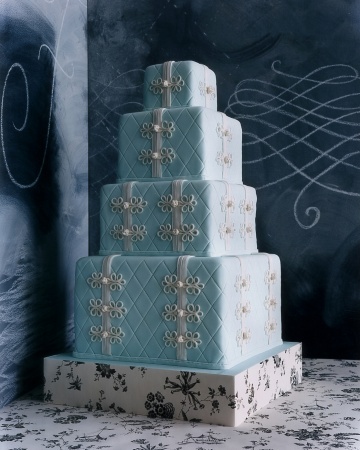 The icy blue color is perfect for a winter wedding and the quilting design on the fondant icing makes it a vision of elegance. And the sugar paste ribbons make each tier look like a lovely gift. And while this cake would be stunning at a winter-themed wedding, it would also work well at a spring or summer wedding. I found this icy blue stunner here.